It is one of the most common modes of transportation, carrying many times the world’s population every month. It is also a very safe way to travel. There is a much better chance of winning the large Euro-Millions prize than of being injured in getting from point A to point B. For those who cannot guess, all of this is true for lifts (elevators in American English). Everyone in the industry should be proud of that performance. At the same time, even better performance is possible. In that spirit, a new standard, EN81-20/50, was published in July 2014. It replaces the old standard, EN 81-1/2+A3, which has been around since 2000. After September 1st 2017, EN81-20/50 will become the only standard in Europe. Until then, both are in force. Besides safety enhancement, part of the reason for the new standard is that elevators are evolving. At one time, hydraulic or asynchronous motors stored in a machine room were commonly used to power an elevator. Now, more and more compact synchronous motors can be found directly stored in the elevator shaft, providing the power needed for motion from there. 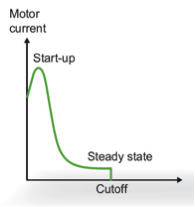 This shift in motor location and type has implications for electric devices, embedded variable speed drives and communication. For contactors and circuit breakers, there are four requirements mandated by the new standard. 1. 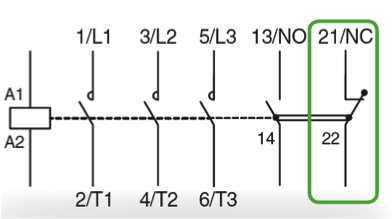 The first is that components have to follow type 1 coordination in accordance with EN 60947-4-1:2010, 8.2.5.1. This means, any short circuit downstream of the circuit breaker/contactor combination must present no risk for the operator and the installation. However, restarting may require servicing via repair or replacement of the contactor. 2. The new standard calls for an 90%AC-3 / 10%AC-4 Utilization Category mix for the main contactors directly controlling elevator motors. Contactors shall be selected accordingly with motor’s usage, keeping in mind that when a motor starts, a current surge is observed. 3. Mirror contacts are compulsory. As specified in EN 60947-4-1:2020 Annex F, a mirror contact is a normally closed auxiliary contact, linked with the main contacts of a contactor such that auxiliary and power contacts can’t be closed simultaneously. Mirror contacts enhance safety, ensuring that contactor’s state is properly transmitted in safety chains. 4. Mechanically linked auxiliary contacts are required for contactors. It ensures that a Normally Opened (NO) and a Normally Closed (NC) auxiliary contact cannot be simultaneously closed or opened. This prevents, again, safety chain errors. 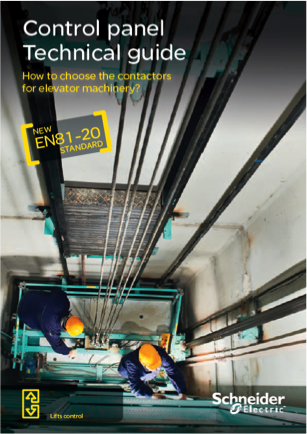 Designing and constructing a modern elevator is a challenge. Ease of use, cost and safety all are important. The new standard can help meet those goals and Schneider Electric is there to provide help and expertise. For instance, in Schneider Electric’s TeSys D motor starter range, auxiliary contacts and contact blocks are intrinsically compliant with the new standard. 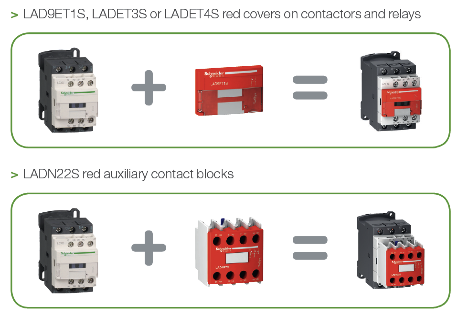 They allow monitoring of the state of contactors and can be incorporated into a safety chain, highlighted thanks to a safety red cover accessory. Specific AC3/AC4 contactor selection with type 1 coordination have also been calculated and are available in our dedicated Control panel Technical guide: How to choose the contactors for elevator machinery. Besides motor starter selection, this guide contains other useful information such as brake contactor selection, relay and contactors’ recommendations, other Schneider Electric components for elevators. First of all thanks for this share. Main contactors directly controlling motors shall, in addition, allow 10 % of starting operations to be made as inching/jogging, i.e. 90 % AC-3 + 10 % AC-4. The key points here are ‘in addition’ and ‘directly’. This requirement is an ‘addition’ and it is only for main contactors ‘directly’ controlling motors. So this requirement is not for ‘all’ main contactors. 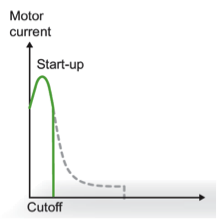 In these cases main contactors don’t make or brake motor load/inrush currents. at the stated system voltage. contactors should be so controlled and interlocked so as to prevent them being opened or closed when the load current is present. When the above conditions are met, the contactors may be chosen according to category AC1. Can you give us some information about using AC1 category for main contactors (Schneider TeSys D) in lift applications with variable speed drives (VVVF)? Indeed, in lift application, AC3/AC4 mix is only necessary for contactors directly controlling a motor : this is why, in the guide, 90%AC3/10%AC4 selection is only proposed for contactors directly controlling the motors. Concerning contactors associated to drives, traditionally proposed selection was AC3. However, standard EN 60947-4-1 Annex I validates use of AC1 contactor if contactor is not actuated when on load. 	> Upstream contactor, used to disconnect VVVF’s power to enable energy savings: this contactor can be chosen in AC1 as it is not actuated under current. Beware, yet to size it regarding VVVF input current and not motor rating. 	> Downstream contactors used for safe stop: depending on safety chain, they may be actuated on load. In that case, we recommend sizing them according to AC3. Nota: please, note that safety contactors should always be positioned below the drive, to ensure that motor is not powered anymore. Safe stop case is very rare in a lift life cycle: During inspection control (manually by a person) direcly depending on safety chain, and emergency stop. In all other cases (normal operation) which is probably more than 95% of the lift cycle, contactors will not be actuated on load. Don’t you think AC3 would be overrated? Maybe an approach could be used similar to “90% AC3 + 10% AC4”. It could be “90% AC1 + 10% AC3”. 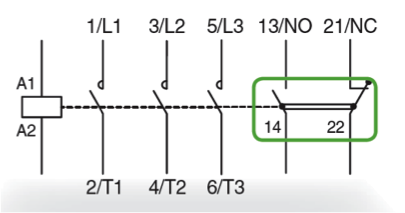 When a contactor is directly controlling a motor, AC1 utilization category shall not be used. Hi, very nice Article shared about Contactors.